After a day of much stressing and debating I had made my mind up about at least one thing – to see Sparrow at the ICA. Why was I stressing, on this the first day of our 4 day Easter weekend? Nothing worth mentioning on here, except to say that I wasn’t getting a Good Friday feeling. Part of the cause of any stress would have surely been helped by a little tipple to relax and relieve myself. But a recent 7 weeks completely off alcohol had shown me that it is NOT a necessity in life, as relieving a power as it can have. But, at the last minute I told myself, “Damn it, it’s a holiday and the next best thing to taking a holiday was to do what I jolly well felt like” [Yes, I was also regretting not using holiday days and flying off somewhere – whilst now trying to enjoy beautifully hot & sunny England…without an alcoholic beverage]. A red wine it was to be – this being my alcohol of choice when having a drink in a picturehouse – and lo & behold one of the early scenes in this movie had the main male & female characters glugging red wine together. I had made the right choice…I would have been having a coffee otherwise or even a water. I’m fully aware though, that Hong Kong can be foggy and a tad smoggy. Many people are aware of this fact but it was proven to me, definitely in the ‘foggy’ sense, in January of this year when I passed through it for a few days. But…I will add that’s it mostly a very clean and pleasant city, or at least the parts I saw. Lovely culture and lovingly cultured. 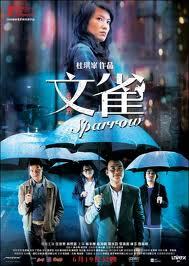 Not giving the plot away, Sparrow is essentially about pickpocketing and is a subject which hasn’t before been covered in such a beautiful way – from my cinema-going and movie-watching experience anyhow. 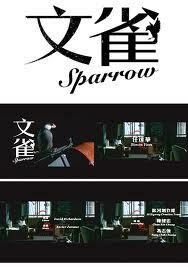 And the relevance of a ‘sparrow’? Well, for one it’s a word for a pickpocket in Hong Kong. 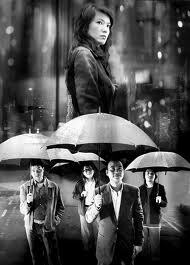 It has such a magical but mysterious start to it, this movie, and we’re treated to some lovely scenes. Look out for one involving an elevator and a balloon. Interesting / amusing. And then there’s a great staircase, or stairwell shot. Some shots, particularly the sleight of hand ones are well done and so ‘sleight’ that if you look away or blink you may miss them…as in fact I think I did on more than one occasion. Any bizarre scenes, characters and/or comedy moments reminded me of many directors works, particularly David Lynch, Luc Besson and even a splash of The Wachowski Brothers. Topping off this unique movie experience is the inclusion of one of the greatest duels – perhaps even to be described as a grand standoff – ever put to celluloid. With all the above taken into account it’s maybe no wonder that the film was selected for the 58th Berlin Film Festival, and as such premiered worldwide during that festival (in 2008). 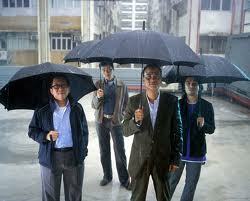 The whole picture could be described as a sleight of hand in film work and it shows what can be achieved by a genius director – a director [Johnnie To] who shot it over a period of three years, 2005 to 2008. A very interesting and entertaining read. 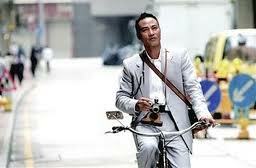 Not only am I interested to see the movie, bit also feel like I.want to see Hong Kong. Thanks for the review. Will be looking out for it as well as pick pockets.